Love tea as much as I do? 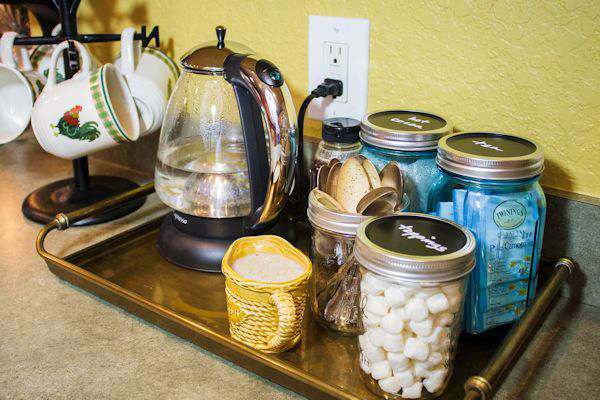 Learn how easy it is to organize a really cute tea station for your kitchen. A couple of years ago, I had to give up coffee, tea, and sodas. My body just couldn’t handle all the caffeine and acid I was drinking all day long. I stopped cold turkey and lived on nothing but water for several months. I was surprised at how easy it was. Later, when I thought my stomach was healed, I tried cold brew coffee. No luck. All the symptoms came back. I so missed that warm mug in my hands in the morning. But, I knew I couldn’t go back to my old friend. My doctor suggested that I try an herbal tea such as chamomile tea. I admit I was afraid to. I tried one cup in the morning for several days. No symptoms. I was ecstatic!!! I was so glad to make friends with my warm mug in the morning again. I have to admit, it was hard smelling my husbands coffee brewing and watching him enjoy his coffee so much in the mornings. He had his area for his coffee maker and mugs. And I……well………had my old pal the mug, which sat in the cabinet. I decided to make myself my very own Tea Station. Nothing fancy. Just a place for all the items to make my mug of tea and I had the perfect place for it in the kitchen. I didn’t want to go buy anything special for my tea station. So, I checked out all my cabinets where I stash all my dishes and items given to me over the years. I found an old copper tray I had put away several years ago. It was the size I needed and a beauty. The perfect start. I grabbed several blue Mason Jars and chalk tops to label what was in the jars. One jar for my chamomile tea, one jar for my homemade hot cocoa mix, one jar for spoons and one jar for marshmallows. The grandkids love a cup of hot cocoa when they visit. I love that they can help themselves now and I’m not searching everywhere for all the items. I also added my Capresso Electric Water Kettle which I love!! It heats up the water fast, holds 1.5 quarts of water, on/off switch on the handle and the kettle is cordless. One tip I have is to keep your water below the top measurement line. If you put too much water, it will come out of the spout area when it starts boiling. I love the look of this kettle with its glass body and stainless steel accents. Not too tall or wide and fits on my tray just perfectly. When its time to make some tea, just slide the on/off switch on the handle on and wait for the concealed heating element to heat up the water. When the water is ready, it shuts itself off. The kettle also uses less energy than using a kettle on the stove. The grandkids don’t have any problems working this kettle. Capresso also carries several other electric water kettles to choose from. 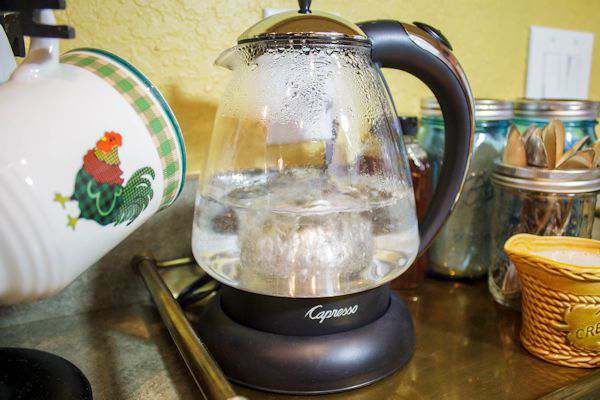 If you prefer different temperatures for your teas, check out the H2O Pro water kettle. I’m so happy with my new tea station and love how it turned out. I’ve even caught hubby checking it out a couple times. He loves hot cocoa too. I also have a cute little country creamer I use to put out for the company. Silk Almond Vanilla Creamer is my choice for a creamer now. Love the taste and I’m not adding heavy fat in my cup of tea. I also now only use raw area honey as my sweetener. I do feel so much better without putting all those chemicals in my body. I’m sleeping better, lost 45 pounds with the help from not drinking all those empty calories, the extreme anxiety I was having is all gone, blood pressure is lower, my overall health is so much better and I was surprised I didn’t have the terrible headaches I had heard about. I am wanting to try different herbal teas now, but not sure which one to try. 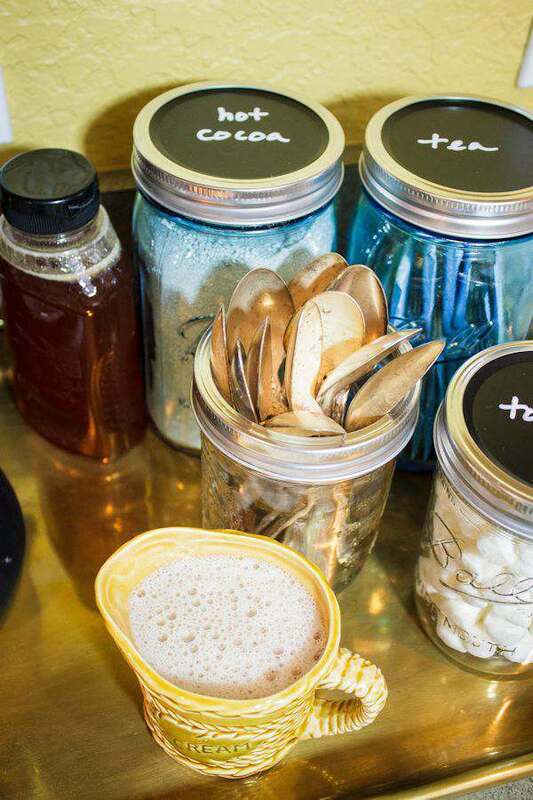 What a cute little tea station and I can relate to adding hot cocoa. It’s my grand kids favorite. I need a Capresso Electric Water Kettle because it will make my life easier for my afternoon tea and there ever empty cups of cocoa. I love your tea station! I am currently trying to give up soda and it is such a struggle. I have recently bought several varieties of tea but I usually just boil the water in a pot on the stove, which is a pain! I would really love a water kettle like this Capresso Electric, it would be so much more convenient and thus I would drink more tea. One of my favorite herbal teas is Trader Joe’s Pumpkin Spice. It tastes so good and when you add a little almond/coconut milk to it, it tastes even better. Thanks Cindy for your tea suggestion. I never thought about going to Trader Joes for herbal tea. It sounds like you are so much healthier without coffee. I don’t know how you made it when your husband was still drinking coffee. I have been trying to switch to tea for a while, and I think I just have to stick with it. I love the idea of having a tea station. No more going back and forth, opening and closing cabinets and shelves. One dedicated place in the house to make your favorite beverage. Awesome. Your tea station is so cute! I recently cut way back on the caffeine and am now drinking herbal tea. What a great tea station! Love those spoons! I’m a water drinker mostly, sometimes I have some juice too. I have same issues you mentioned. I love Peppermint Tea because it soothes my stomach. Thanks for wonderful tea station idea! Love that you are not hesitant to share your love for Christ. HI Sandra. Thanks for the suggestion of Peppermint Tea. Thanks for the suggestion of the peppermint tea. I haven’t tried that one yet and thanks for stopping by. I love that tea station idea of yours. I’m a coffee lover and its really hard for me to start my day without a cup of coffee. During cold days, I sometimes make a ginger honey tea or hney lemon tea. Green tea is also one of my favorite. Hi Lhourdes. Thanks for stopping by and your suggestions for teas. I put honey in my tea and maybe I should add a bit of lemon sometime. 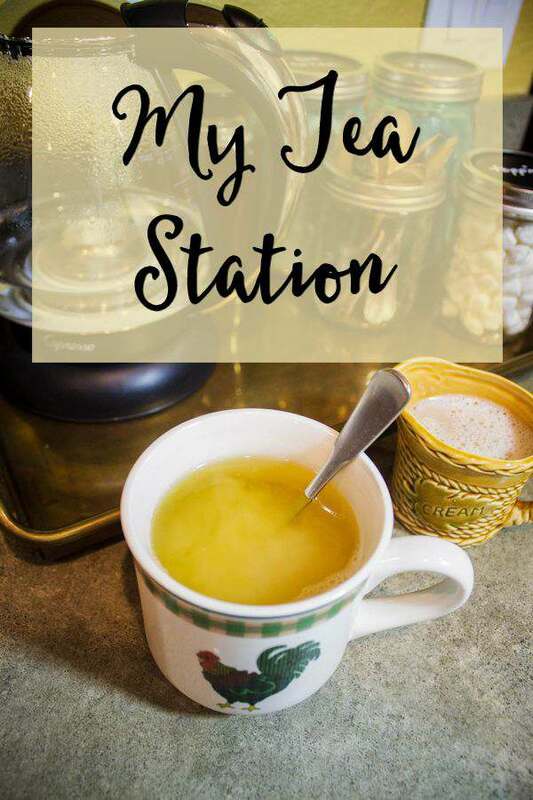 A fabulous tea station, Tammy! It makes all the difference, doesn’t it? I’d be coming around for tea all the time if I lived near you! I love your little tea station. it makes it seem more special if you turn the whole thing into an event with your own special area – hope means that you don’t miss the coffee so much anymore! I quit coffee almost a year ago so I know how hard it is but I’ve fallen in love with tea! Almond herbal tea is one of my favourites. I love your tea station. I need to cut down my tea collection to fit somewhere like that. I’m a big fan of hot chocolate, too, so that’s a nice addition. Congrats on losing 45 lbs(!) and feeling better! I’ve seen a lot of coffee stations and it’s nice to see a design inspiration for a tea station instead! Thanks for sharing your own and some ideas as well. I love drinking tea! I would be lost without my daily tea!!! 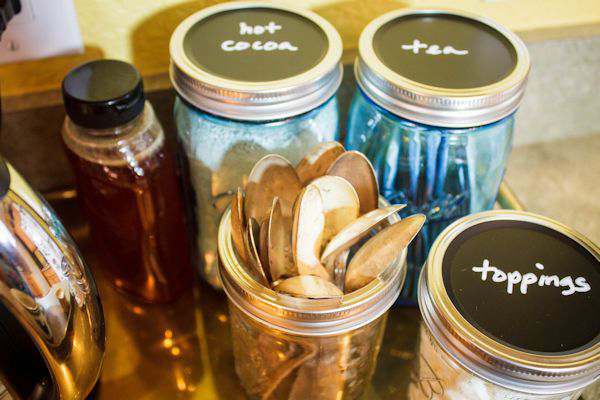 I love these tea station idea, I have one similar, I love the chalkboard lids! 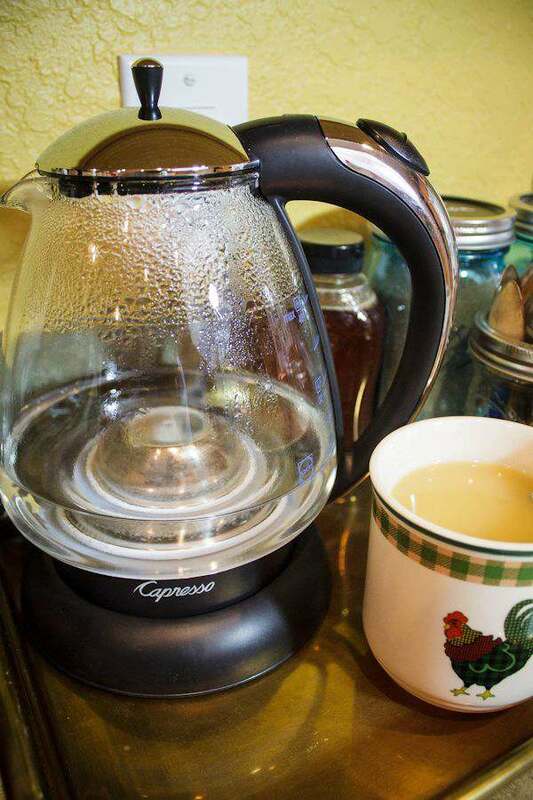 Te Capresso Electric Water Kettle looks like the one we got at home, but this is so much better from what I can see! lol. I love your tea station! I should have a tea station at home too! I am not a coffee person and prefers tea. I love chamomile tea as well as peppermint. It gives me the needed kick to start my work. Now that I am breastfeeding, I stopped drinking tea. I miss it but was used to drinking water already. I love your tea station! It’s so cute and handy! I have a beverage cart in my kitchen that has a Keurig. I usually use the Keurig to make hot water for my tea, but sometimes my tea ends up tasting like coffee! I would love to get an electric tea kettle likes yours. Thanks for sharing! I love the idea of having a tea station. I’m so used to seeing coffee stations so this is fun! I wish my kitchen was a bit bigger so a tea station! Omg love this!!! I am a huge tea drinker since I don’t drink coffee!!!! That is so good. I love my tea and I might drink coffee once a week when hubs want to share. But right now I enjoy chai teas, not the creamy ones. The herbal ones.